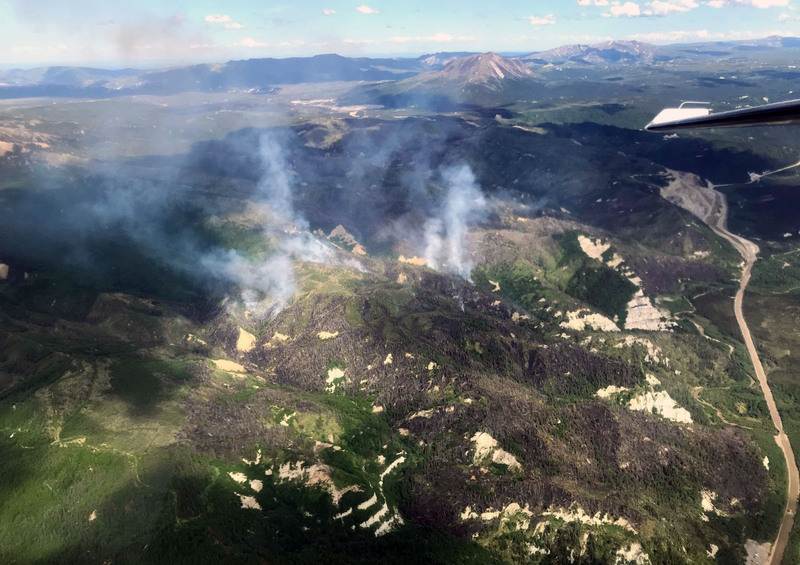 The Alaska Division of Forestry is continuing work to confine a wildfire ignited by a coal seam fire near Healy on Tuesday. The Louise Creek Coal Seam 2018 Fire was estimated at 763 acres as of Thursday afternoon, a decrease of more than 1,000 acres from previous estimates. The decreased acreage is a result of better mapping. The fire is burning about 5 miles northeast of Healy and the Usibelli Coal Mine in an area that has had several coal seam wildfires in previous years. Due to the hazards posed by coal seams, firefighters are not taking direct suppression action on the fire and are instead using water drops by air tankers, helicopters and water-scooping aircraft to keep the fire in check while they rehabilitate an old dozer line west of the fire along Francis Creek. Fire managers’ objective is to keep the fire east of the dozer line and north of Lignite Creek on the south side. There are 59 personnel working on the fire, including two crews and four bulldozers. Bulldozers completed the approximately 2-mile dozer line on Thursday and crews began plumbing the containment line with hose and pumps in the event they need to conduct a burnout along the east side of the line in the future. Crews are also working to improve the containment line by thinning trees and brush along the sides. The fire received light precipitation overnight but no significant rain. The fire did make an approximately 15-acre run overnight on the west flank to within about 300 feet of the dozer line. A helicopter was being used Friday morning to drop water on that part of the fire to keep it from threatening the containment line. A burnout along the dozer line is a last resort, Fusco said. “We’re not going to put any more fire on the ground if we don’t have to,” he said. Fire activity has picked up in the afternoon during the last two days because of hot, dry, windy conditions, Fusco said. Cooler, wetter weather is in the forecast but Fusco said they are not relying on the weather to tame the fire. “We’re not counting on the weather so we’re going to keep doing good work,” he said.